Lumping all Chinese food into one category is like defining gumbo and cheesesteak both under the label of “American Food.” Sure, they’re all foods from America, but New Orleans’ Creole cuisine is a whole different animal from Philadelphia’s famous sandwich (with Whiz, please). Very few of China’s famous regional cuisines are represented in Seattle’s restaurant scene, but there’s enough to give a whirlwind tour to someone who’s only ever known the Americanized, General Tso’s style of “Chinese” food. Sichuanese: Spiced Sichuanese cuisine is known for its heavy use of a pair of peppers: the spicy-hot red pepper and the numbing Sichuan peppercorn. Spiced uses them in perfect balance in classic Sichuanese dishes such as dan dan mein (sesame-dressed noodles with meat), as well as in its extensive selection of cold appetizers, which one can order an array of by pointing at what looks good in the case up front. Options range from potato strands to pig ear. 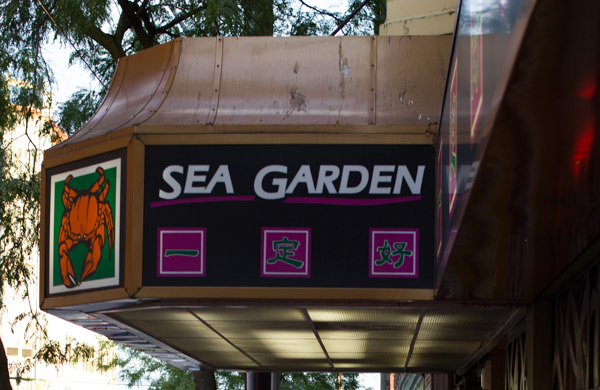 Cantonese: Sea Garden Cantonese food hails from the province of Guangdong, which, like Washington State, has an extensive shoreline. Sea Garden takes the subtle cooking of this Chinese region and marries it beautifully to fresh Northwest seafood, resulting in Dungeness crab in black bean sauce, salt-and-pepper spot prawn, and pan-fried geoduck. Shanghaiese: Din Tai Fung Purists will argue that Din Tai Fung is, in fact, a Taiwanese restaurant. It’s true that the international chain got its start in Taipei, but the specialty that made it famous, xiao long bao, or soup dumplings, is distinctly Shanghaiese. The thin-skinned dumplings, filled with rich, hot broth and a small meatball, are time-consuming and difficult to make, but the chain trains employees to make the 18-pleat delicacies by the hundred, and there’s nowhere else in town to try a good version. Taiwanese: Henry’s Taiwan Plus Henry’s version of Taiwanese food is not the most authentic—he came to Taiwanese cooking later in life—but it is the most faithful, delicious incorporation of the cuisine. His background in French fine-dining brings deliberate flavor and precise execution to traditional dishes and flavors. The three-cup chicken is a great introduction to the island’s cuisine, while more daring eaters should be unafraid to try the garlic chitterlings or oyster omelet. Northern: Dalian House Named for a peninsula in the Northern corner of China, equidistant from Beijing and Korea, Dalian House serves the warming, comforting dishes of a cold land. Pickled napa cabbage stew with pork goes perfectly with plump boiled dumplings. Familiar dishes like the famous Sichuan dish of twice-cooked pork are just as good as the more obscure options—such as the Beijing yogurt, offered on the beverage menu. In need of an outlet for her effervescent enthusiasm for all things edible, Naomi Bishop started sharing her thoughts on food at her blog, TheGastroGnome, in 2006. Her lack of fear—she’ll eat anything and go anywhere—lead her to discover restaurants hidden in plain sight or find the most delicious needle in the haystack of a menu. Her writing appears on Serious Eats, Eat Your World, and in the Seattle Weekly. Download her app, Unique Eats of the Northwest to find the best restaurants you’ve never tried.